Peter Lindbergh: "The beginning of the end of photography"
German photographer Peter Lindbergh was recently invited to Munich as a guest of honour at the opening of his solo exhibition "Peter Lindbergh – from fashion to reality". Events like this normally don't really make headlines in the celebrity-spoiled Bavarian capital, but the announcement of his visit created a lot of buzz and excitement. One day before the opening of the exhibition, the photographer appeared for a signing of the book to the exhibition at the museum's reception. He was there for six hours(!). Lindbergh affirmed that "everyone visiting the exhibition should come by for a signing." The waiting line for the book signing extended from the museum to the next crossroad and continued all the way to Schumann’s bar. The demand for the book was so great Taschen Verlag has to reprint it already. More than 1.600 people attended the celebrity-adorned vernissage with the opening weekend attracting quite a crowd. Peter Lindbergh turned models into stars. And became a star himself. Peter Lindbergh was born Peter Brodbeck in 1944 in Leszno, Poland, and is one of the most successful German photographers and clearly, judging by the exhibition’s sensation, one of the most popular ones as well. Going through the exhibition, it really became clear to me for the first time why he is so popular: he defined the way I (and many other people) perceive beauty. I grew up with the ideal image of the supermodel, to me Cindy Crawford was the most beautiful woman in the world. As a teenager, I used to work out to her fitness workout video "Shape your body". From the end of the 80s, Lindbergh’s images became the epitome of the supermodel era and made supermodels not only well-known but almost larger than life and worldwide recognizable by first name: Cindy, Naomi, Linda. Franca Sozzani, the legendary editor-in-chief of Italian Vogue (1988 – 2016) had said of him: "Peter is a photographer who will define the history of photography, and this is because he is not tied to any trends. He has his own identity; he is not a fashion photographer. He uses fashion to address women and to talk about women, which is entirely different." His cinematic black and white images marked a new period in photography. Lindbergh went against the glossy magazine trend of his time of the perfectly styled, impeccably dressed diva in a strong pose. He brought about his zeitgeist of "naturalness", and this is what made the press characterize him as "the photographer of truth". 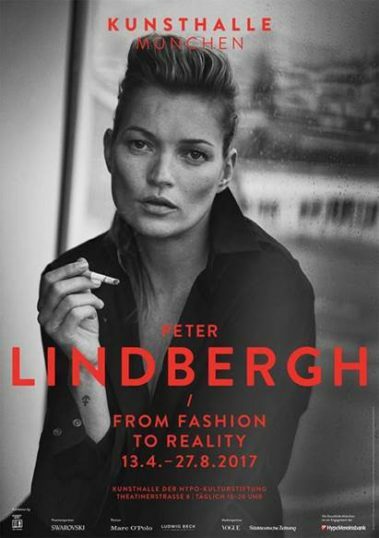 The touring exhibition "Peter Lindbergh: From Fashion to Reality" was developed by Kunsthal Rotterdam in collaboration with curator Thierry-Maxime Loriot and Peter Lindbergh himself under the title "Peter Lindbergh: A Different Vision on Fashion Photography". In three years Loriot collected more than 500.000 images from Lindbergh’s personal archive, many unpublished works and previously unseen material as well as personal notes, providing an incredible experience of looking through the keyhole into the photographer’s life. Handwritten thank-you notes by Claudia Schiffer, the first computer-typed letter by Linda Evangelista ("I LOVE YOU WITH ALL MY HEART AND MEAN IT EVEN IF YOU ARE A GERMAN PIG") and contact sheets with markings; and it’s always fascinating to see which pictures didn’t make it to print. I hear a woman sitting behind me at the press conference whisper: "I’m really curious to see how he is in person, if he has that charisma like Jean Paul Gaultier". Obviously she must have attended the opening of Jean Paul Gaultier exhibition the previous year. And indeed he was charismatic. I summed up the most interesting excerpts of his press conference below. I am very happy to be in Munich today. The streets are so beautiful; they always make me wonder if there used to be anyone else apart from royalty living in this place. Fashion photographers have responsibility too. Today with Photoshop we can retouch every trace of life from the face, every thought that had once manifested itself. In this way, we turn human uniqueness into nothing. I like to leave women as they are, without spoiling their features. When people ask me how my portrayal of women has changed over time, my answer is that it has been the same since 1980. It is about having the courage to be yourself. This is true beauty. Professional photographers can distinguish themselves only through the personal perspective they develop after 20, 30, 40 years. I think many great photographers dismiss this development too early. You can never take better pictures than the millions of smartphone photos out there. There’s a lot to learn from smartphone photography before rejecting it as "garbage". The lightness, for example (he takes a picture of the gathered press in front of him with his cell phone). Look at this (laughter). I’m taking a picture, otherwise nobody believes it. And I’m not part of the whole discussion about different camera brands. All this is rather romantic for me and a waste of time. I don’t care much about the camera, I grab whichever I find in the cabinet. This is the worst there is. Then, why do people take them? Wow, I was in Helsinki. I had dinner with Madonna – what does that say? You take a selfie only so that you show who you had lunch with? Hoping that you too catch a little of the glamour. We make ourselves so small. We have to think about whether this is something we truly want. I don’t see it as danger but rather as stimulation. It is great to scroll down your feed of 70 new posts in the morning. Among them there must be at least five that are bound to stimulate your thought or inspire you. When you speak in front of masses, you can talk about all kinds of silly things. But when you have five sharp journalists opposite you, then it can be hard. The same goes for photographs: when there are a lot of cameras, it’s no problem. When there’s only one, it is daunting. There’s no worse than when I’m being photographed by one person, even if it’s just for a passport picture. Then I find myself pressing my lips and making an effort somehow… I know how I would have to position myself to the camera in order to look better (he turns his head sideways, narrowing the eyes). But you dare not do it, because you feel caught in the act of being vain and trying to look better. This started in 1990 with Helena Christensen. I wanted to create a story with an alien who lands on Earth and gets picked up by a not-so-bad-looking girl; this was Helena. For six months we kept it under wraps. 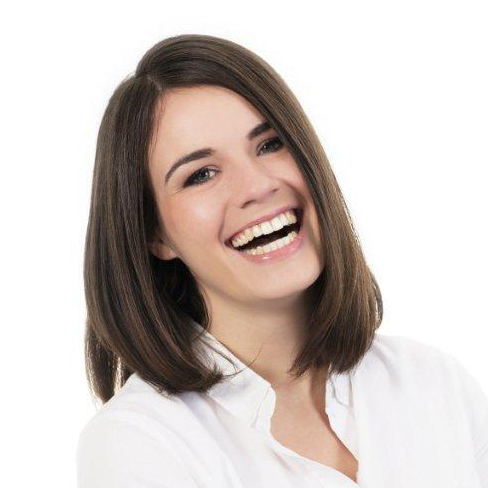 It was her first story and we wanted a brand new face. In the photos Helena shows the alien the desert and they walk around trailers. You can photograph 100 pages like that without ever asking what should I do next, because you have this story. At Comme des Garçons it was like this: Rei Kawakubo came to Europe in the 80s. Thank God she did, because Paris was ready to yawn and the Japanese brought it back to life. She asked me to work with her at the hotel she was staying. There were about 20 Japanese all dressed the same, in black and white with patent shoes. The interpreter said to me: Madame Kawakubo says that you are her favourite photographer and you should shoot her commercial campaign. I had never done that before. I was given “carte blanche” permission to do what I wanted, which was rather difficult as I didn’t know what I was supposed to do. Then she showed me the collection, which consisted mainly of uniform pieces, something between Nazis and Communists. So I thought about creating a scene with the models as guards of an industrial revolution, before machines. It wasn’t only an idea, it was simply natural. I cannot imagine taking photos without telling a story. What do we do then? Then you’re left with a girl who stands there like this and like that in ten different poses and eventually you fall asleep. It’s boring and difficult to do. When you don’t need a story, you might as well go to the desert or the beach where there’s nothing in your way and you don’t have to go into anything, like in the studio. Effort is of no use whatsoever. The only thing that’s useful is talent. Of course, you can get by without talent looking what happens left and right and hang in there and look good for a while. This is what 99% of photographers do. And then there are the “seers”. These are people who perceive things through their own eyes. They don’t need any special training or degree. Those are the geniuses, just doing their thing. They know exactly what’s right and what’s not and require nobody’s validation. Today all photographers work with digital media, except Tim Walker perhaps. What I find really problematic with digitalized photography is that most photographers who work with digital media allow themselves to plug their camera onto a screen in the studio where everyone can see what the photographer does each second. And that’s when the end of photography begins. Last week I had to work with a stylist from Interview Magazine. He became sick and sent his assistant. I almost threw her out of the studio. She would come every five minutes and say to me “lower the camera, this is much better”. They sit behind their screens and the only thing the poor guy is allowed to do is press the button. When a magazine asks me if I can do 20 pages for a specific collection, what usually follows is a fashion book from the editor with entire moodboards. For me this is another aspect spoiling photography, and of course the editor will say “it’s just for inspiration”. But in fact the models end up looking exactly like in the moodboards and she will ask me “which picture should we start with?” So much for inspiration. I was once harshly criticized because I compared fashion photography to a cow. The cow chews the grass, brings it back up and rechews it seven times again. Always the same grass. All the chewing turns grass into “fluff” and we put this green bio-omelet on the grass and call it photography. I’m often asked if my images constitute art and I always say, I don’t care. It doesn’t change the image, it just makes it more expensive. There’s a big ongoing discussion on photography as art and as I stated in an interview with the Artforum, the boring overchewed images end up in the trash bin. And the beautiful, fresh, innovative, engaging ones end up in the museum. Whether we call it art or not is of little importance. After the press conference, the photographer encountered Inga Griese, Icon's editor-in-chief. He went over to her, embraced and kissed her. They obviously know each other, old members of the same tribe. Also when Annekatrin Meyers from young Munich magazine “rush4” approached him with a pounding heartbeat and reminded him of their work together on a photoshoot, he gave her a spontaneous embrace. A beautiful genuine scene, very much like his images. The exhibition will be open at Kunsthalle München from 13th April to 27th August 2017. Swarovski, Marc O’Polo and Ludwig Beck are the main sponsors of the exhibition. Taschen Verlag published a high quality 472 page book on the exhibition.